Packaging: 1, 2, 5 and 25 litre bottles. Use ClearShield® on most substrates, including waterproof canvas, vinyl, banners, fiberglass, wood, metal, plastic, and paper. You can apply it over solvent-based inks and most water-based paint systems. ClearShield® is available in several versions. This chart gives you information about each product. Thickest film build. Suitable for vertical applications. Lower viscosity than original ClearShield. Same resin solids. Easy clean up when used with liquid laminators. Water resistant canvas applications (highly flexible). Also suitable for micro porous ink jet receptive substrates to help reduce or eliminate pinholes. Use all techniques, including most automated equipment. Satin is best applied by spray or liquid lamination equipment. Highly flexible. Excellent chemical resistance. *Not recommend for use with eco-solvent and UV inks. Use all techniques, including most automated equipment. 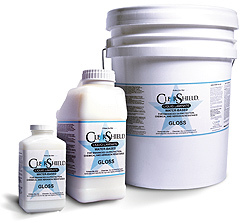 Use over UV curable ink, solvent ink and Eco-solvent ink. Ideal for hard substrates. Highly flexible, chemical and ultra-violet resistant. Two-component, water-based clear coat easily cleaned with solvent or Clearstar's non-petrochemical citrus based cleaner.